She first worked as a clerk in an avant-garde bookstore, the Sunwise Turn, where she became enamored of the members of the bohemian artistic community. In 1920 she went to live in Paris, France. Once there, she became friendly with avant-garde writers and artists, many of whom were living in poverty in the Montparnasse quarter of the city. Man Ray photographed her, and was, along with Constantin Brâncuși and Marcel Duchamp, a friend whose art she was eventually to promote. Peggy urged Emma Goldman to write her autobiography and helped to secure funds for her to focus in Saint-Tropez, France, on writing her two volume Living My Life. In January 1938, Guggenheim opened a gallery for modern art in London featuring Jean Cocteau drawings in its first show, and began to collect works of art. Guggenheim often purchased at least one object from each of her exhibitions at the gallery. After the outbreak of World War II, she purchased as much abstract and Surrealist art as possible. In August 1939, Peggy Guggenheim left for Paris to negotiate loans of artworks for the first exhibition. In her luggage was a list drawn up by Herbert Read for this occasion. Shortly after her departure the Second World War broke out, and the events following 1 September 1939 made her abandon the scheme, willingly or not. She then "decided now to buy paintings by all the painters who were on Herbert Read's list. Having plenty of time and all the museum's funds at my disposal, I put myself on a regime to buy one picture a day." When finished, she had acquired ten Picassos, forty Ernsts, eight Mirós, four Magrittes, four Ferrens, three Man Rays, three Dalís, one Klee, one Wolfgang Paalen and one Chagall among others. In the meantime, she had also made new plans and in April 1940 had rented a large space in the Place Vendôme as a new home for her museum. 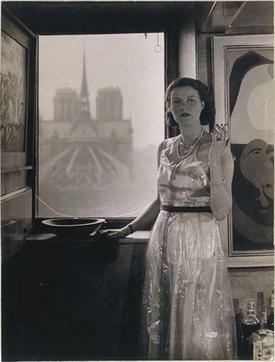 A few days before the Germans reached Paris, Peggy Guggenheim had to abandon her plans for a Paris museum, and fled to the south of France, from where, after months of safeguarding her collection and artist friends, she left Europe for New York in the summer of 1941. There, in the following year, she opened a new gallery which actually was in part a museum at 30 West 57th Street. It was called The Art of This Century Gallery. Three of the four galleries were dedicated to Cubist and Abstract art, Surrealism and Kinetic art, with only the fourth, the front room, being a commercial gallery. Peggy Guggenheim held important shows, such as the show for 31 Women artists, at the gallery as well. Her interest in new art was instrumental in advancing the careers of several important modern artists including the American painters Jackson Pollock and William Congdon, the Austrian surrealist Wolfgang Paalen, the sound poet Ada Verdun Howell and the German painter Max Ernst, whom she married in December 1941. She had assembled her collection in only seven years. Following World War II – and her 1946 divorce from Max Ernst – she closed The Art of This Century Gallery in 1947, and returned to Europe; deciding to live in Venice, Italy. In 1948, she was invited to exhibit her collection in the disused Greek Pavilion of the Venice Biennale and in 1949 established herself in the Palazzo Venier dei Leoni ('unfinished palazzo of the lions') on the Grand Canal. The Peggy Guggenheim Collection is one of the most important museums in Italy for European and American art of the first half of the 20th century. Pieces in her collection embrace Cubism, Surrealism and Abstract Expressionism. Peggy Guggenheim lived in Venice until her death in Camposampiero near Padua, Italy, after a stroke. Her ashes are interred in the garden (later: Nasher Sculpture Garden) of her home, the Palazzo Venier dei Leoni (inside the Peggy Guggenheim Collection), next to her beloved dogs. According to both Guggenheim and her biographer Anton Gill, she had a considerable sexual appetite and it was believed that, while living in Europe, she had "slept with 1,000 men". She claimed to have had affairs with numerous artists and writers, and in return many artists and others have claimed affairs with her. In her autobiography, Peggy provides the names of some of these lovers, including Yves Tanguy, Roland Penrose and E. L. T. Mesens. Her first marriage was to Laurence Vail, a Dada sculptor and writer with whom she had two children, Michael Cedric Sindbad Vail (1923–1986) and Pegeen Vail Guggenheim. They divorced about 1928 following his affair with writer Kay Boyle, whom he later married. Soon after her first marriage dissolved, she had an affair with John Ferrar Holms, a writer with writer's block who had been a war hero. Starting in December 1939, she and Samuel Beckett had a brief but intense affair, and he encouraged her to turn exclusively to modern art. She married her second husband, painter Max Ernst, in 1941 and divorced him in 1946. Among her eight grandchildren is Karole Vail, who was appointed director of the Peggy Guggenheim Collection in 2017. In April 2015, a new documentary film, Peggy Guggenheim: Art Addict, began premiering at film festivals, including the San Francisco Jewish Film Festival on July 26, 2015. ^ "Living My Life | The Anarchist Library". theanarchistlibrary.org. Retrieved 2017-07-31. ^ Laurence,, Tacou-Rumney,. Peggy Guggenheim : a collector's album. Paris. p. 84. ISBN 2080136100. OCLC 35396116. ^ Shenker, Israel (December 24, 1979). "Peggy Guggenheim Is Dead at 81; Known for Modern Art Collection". Encyclopedia Titanica. ^ "Peggy Guggenheim Collection". guggenheim.org. The Solomon R. Guggenheim Foundation. 2004. Retrieved 14 June 2017. ^ Out of this Century: Confessions of an Art Addict, Peggy Guggenheim, published by Andre Deutsch, London. 2005. This page is based on the Wikipedia article Peggy Guggenheim; it is used under the Creative Commons Attribution-ShareAlike 3.0 Unported License (CC-BY-SA). You may redistribute it, verbatim or modified, providing that you comply with the terms of the CC-BY-SA.